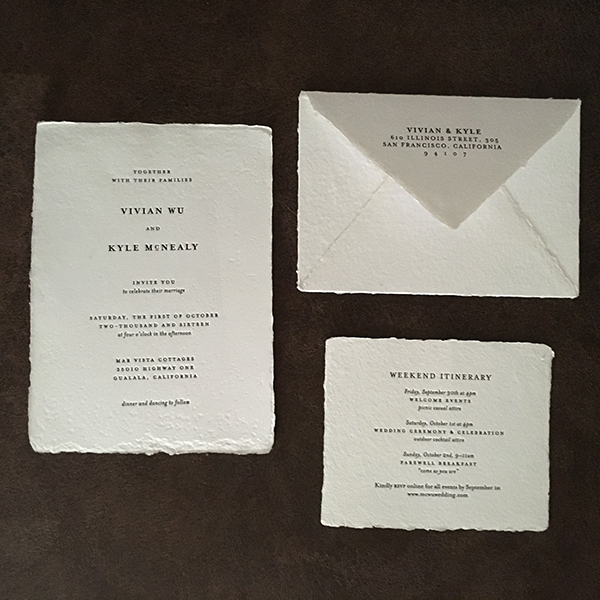 Modern letterpress is all about the feel of those tactile, luxurious papers and the bite into the paper. With these attributes in mind, how do you make the decision of cotton or bamboo or 1-ply versus 2-ply? 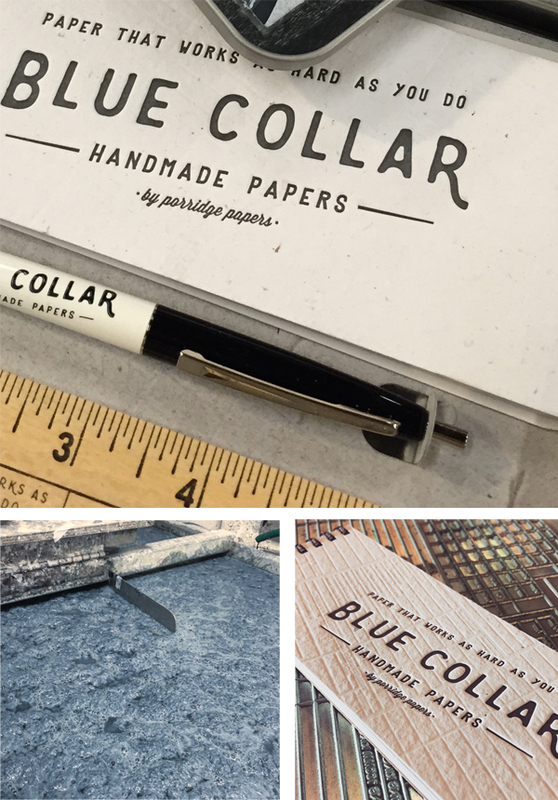 While we do not sell letterpress paper here at Boxcar Press, we do have some nifty tips to help navigate your way through the sea of paper possibilities for your next letterpress printing project. 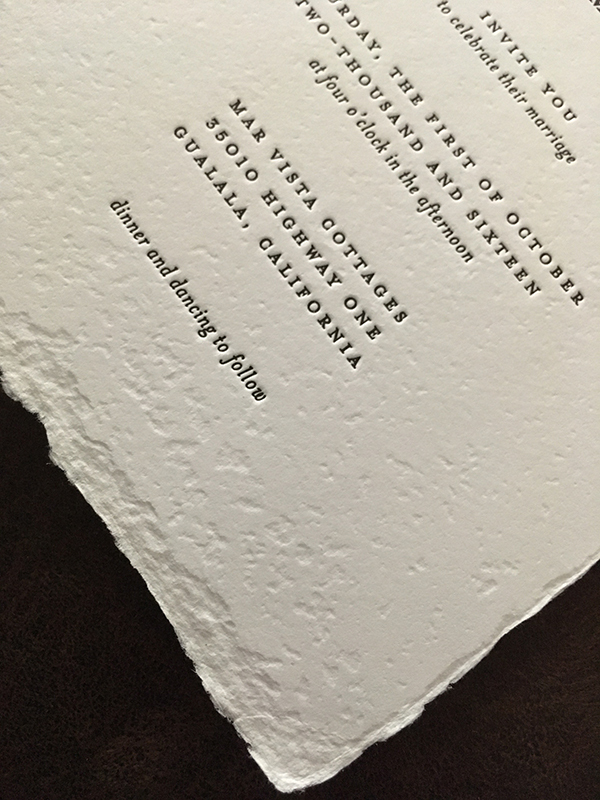 Most letterpress papers are uncoated paper stock (a paper with no gloss or shininess to it). 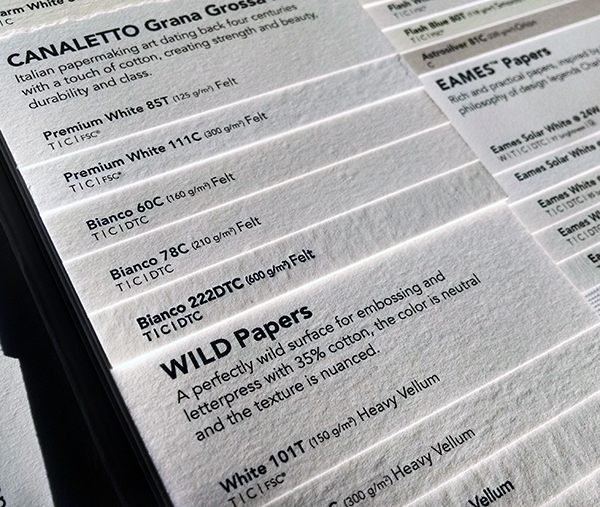 Most papers come in ivory or a shade or two of white from a bright white to a natural white. 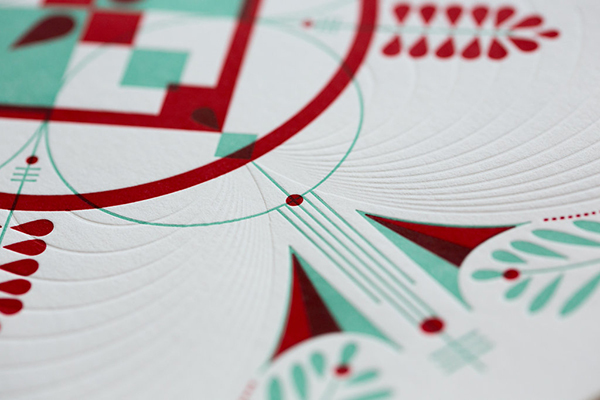 A paper with a nice texture that aligns with your overall project’s aesthetic is a good choice. Papers sold are categorized by the overall weight of a ream of paper (or 500 sheets of paper) -“lbs“ refers to standard American English pounds and “gsm“ refers to metric grams/square meters. A traditional 1-ply paper is usually 110lb or 300 gsm. A traditional 2-ply paper is usually 220lb or 600gsm. In comparison, printer copy paper for a copier or at-home inkjet printer is usually 20lb or 54gsm. 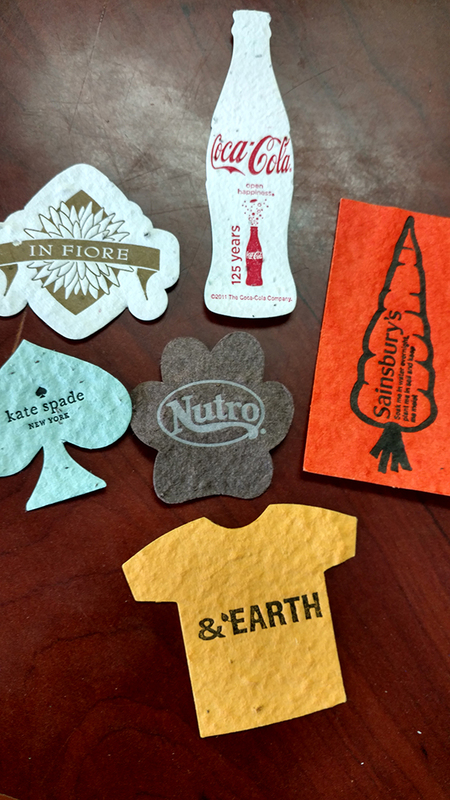 Whether you are a newcomer to the letterpress printing & paper world or a seasoned printer who is looking for a new paper, we heartily recommend (if possible) that you purchase or obtain paper samples. 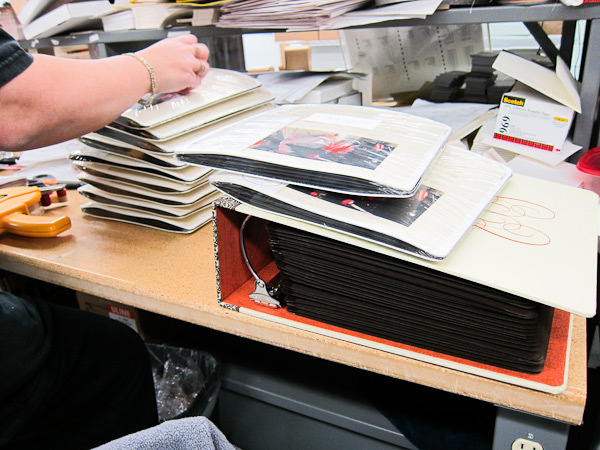 If you have a keen affection or interest in a certain paper company’s stock of papers, you will find most companies either sell paper swatch books for a reasonable price or, in certain cases, have free paper samples. We have compiled a list of papers for your musing and contemplation. (Note that these prices do not include shipping costs and are current pricing for the items themselves at the time of this post). General directory of sample packs: visit the following sites for a wide variety of papers and envelopes. 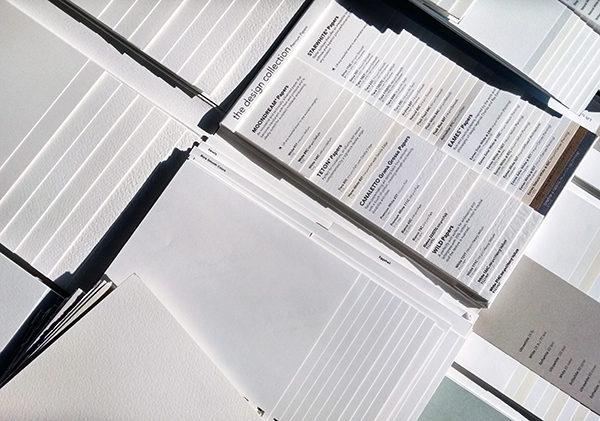 Staff Pick: Legion Paper’s Letterpress Selections is $8, and includes 22 different types of 3.5” x 5” paper samples, including Arturo, Colorplan, Rising Museum Board, Stardream, and Legion Bamboo, to name a few. 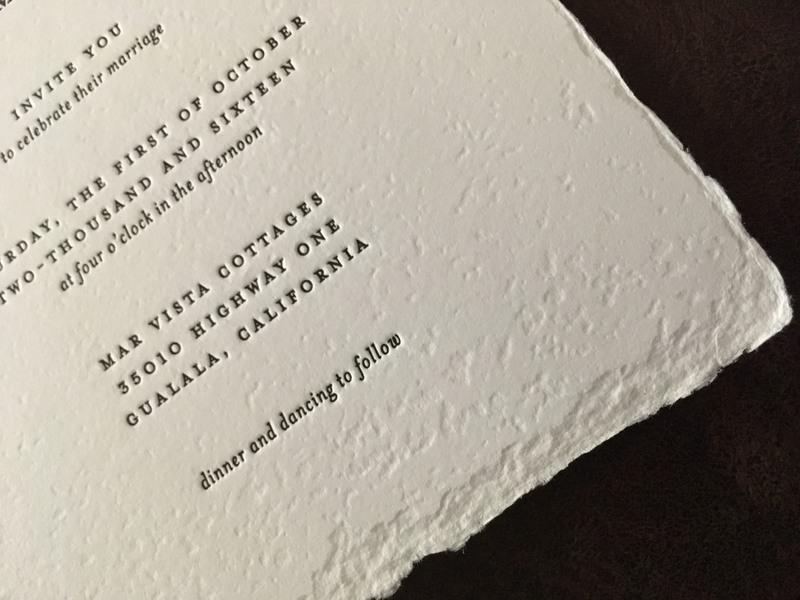 What letterpress papers to use? 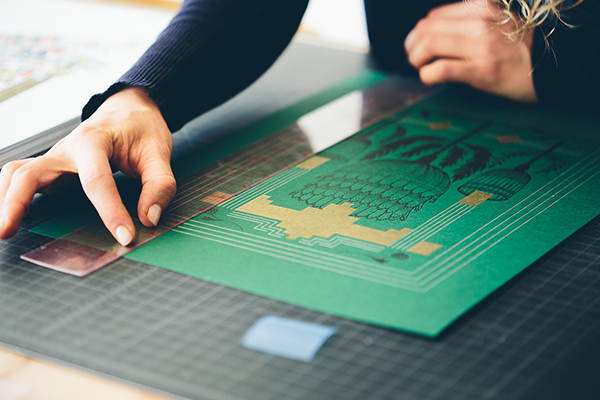 There are major factors that influence what paper to use for a certain project. Factors may include: budget, thickness of paper for impression depth ability, impression aesthetic, and overall aesthetic. 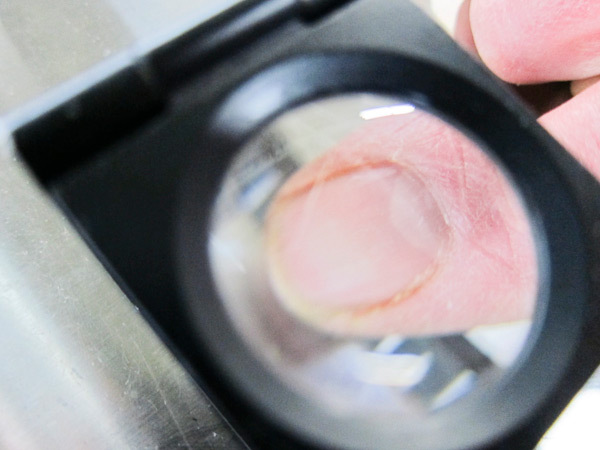 Determine what your projects needs are and research your paper to fit those needs. If you can shop around for pricing… we heartily support it to banish away those barren budget blues. If you are aiming for a softer impression, try a cotton rag paper like Crane’s Lettra. For a soft but tighter fiber paper, try a bamboo paper or something with less than 100% cotton content (example: Cardenon papers have 20%-35% cotton content). 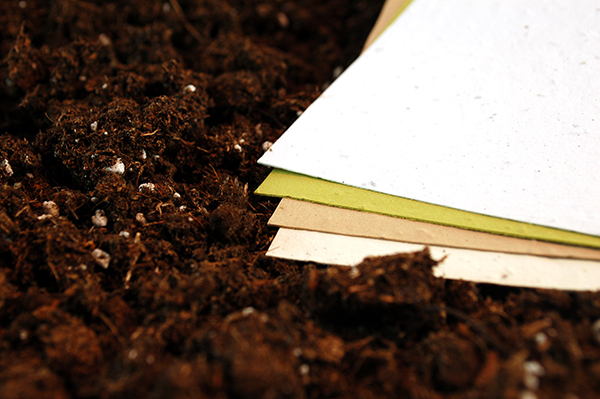 Some might like the natural recycled content of a chipboard or kraftboard. 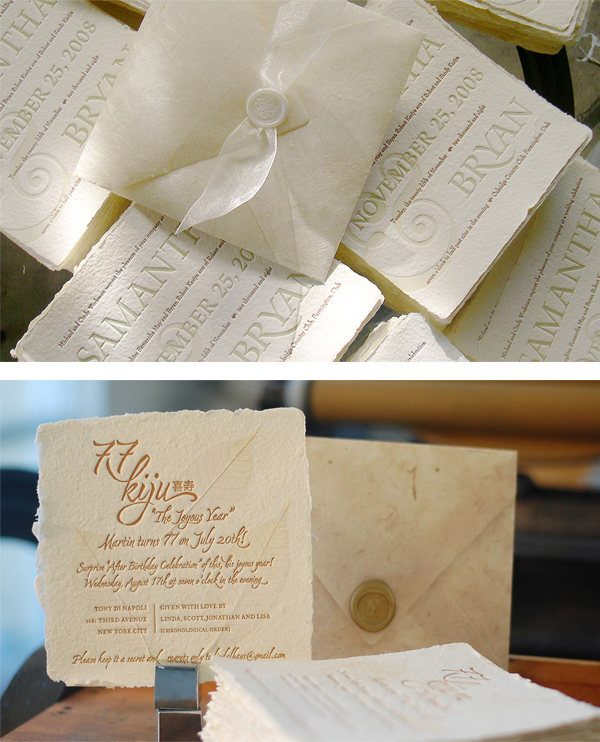 Don’t avoid handmade papers thinking they are out of the budget. There are paper vendors who make beautiful papers in many colors that are favorably priced and will add a “wow” to your project. Handmade papers, which are a unique style of paper all on its own, will usually have a distinct, pronounced texture or feel to the paper where there are minute differences from sheet to sheet. 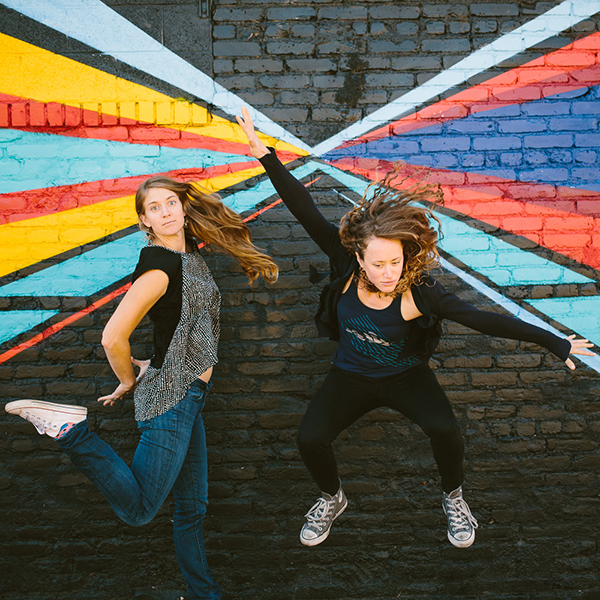 Think of each sheet as “sisters” – similar look but unique all on its own. Deckled edges (or the feathery edges you see on the edge of the paper) are common with handmade papers, although there are papers that do not have the deckled edge. You can cut off the feathered edge if you wish. 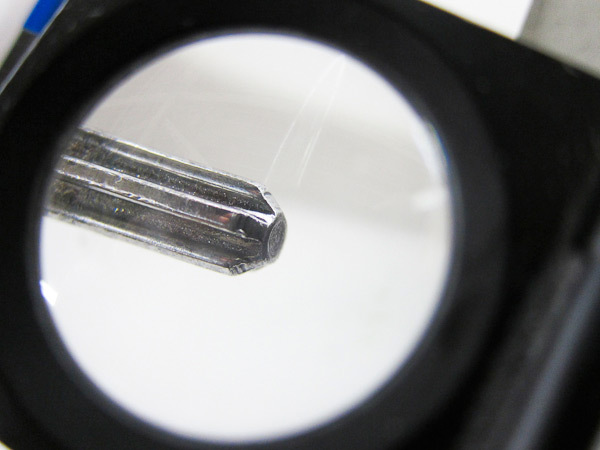 This uniqueness is often sought after for custom projects. Embrace and explore all the options and special papers available to you. 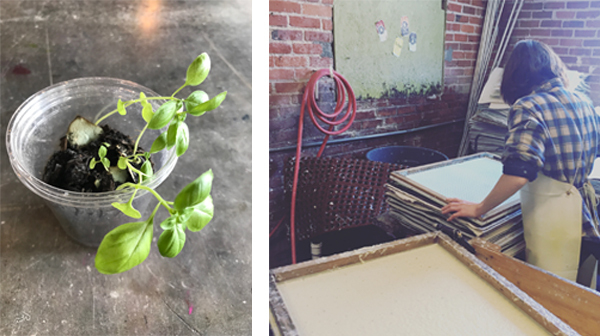 Crane’s Lettra: “soft and luxurious to the touch, yet strong and stable on press, the distinct, extra bulky “letterpress” finish of 100% cotton is rare in machine-made paper.” Crane’s Lettra is a staple for our commercially printed projects here at Boxcar Press as well. Neenah Paper offers your first swatchbook for free, each additional copy is $10.95. 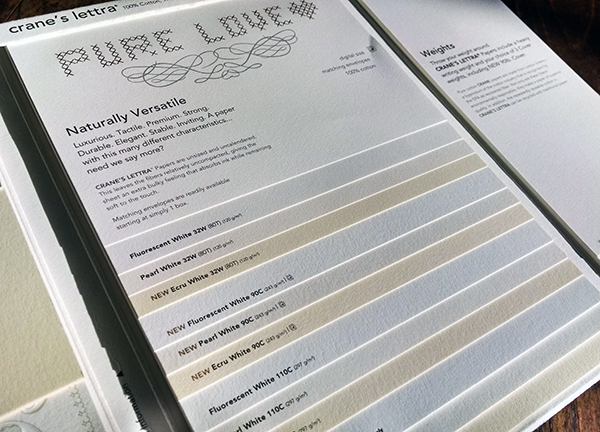 They also offer free paper swatches and envelopes – samples are available for Crane’s Lettra Pearl White, Crane’s Lettra Fluorescent White, and Crane’s Lettra Ecru. Legion Paper also offers Crane’s Lettra, with a sampler pack available for $5. Neenah Paper offers your first swatchbook for free, each additional copy is $14.95. Fabiano Colored Paper and Fabiano Artistico White Rag: An Italian paper mill creates this luxurious soft, cotton-based paper that has a modified cold-pressed surface texture that provides an intriguing paper feel. Available through the “Watercolor Paper Sampler” pack from Legion Paper for $12. 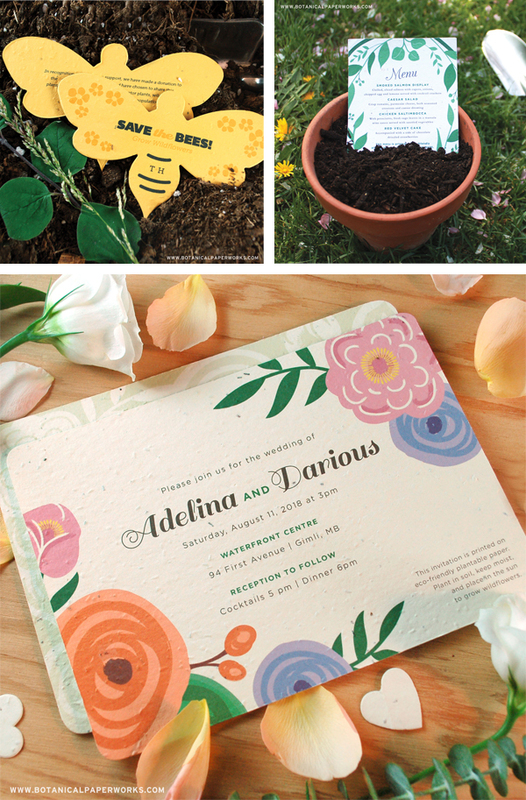 Holyoke cotton papers: A soft paper cotton-based paper with a smooth feel and a good alternative to consider for wedding invitations and similar pieces. A sample set is available through Holyoke Fine Papers and Supplies for $7.70 per pack. Legion’s bamboo paper: This bamboo paper has a tighter fiber weave and is great for business cards. 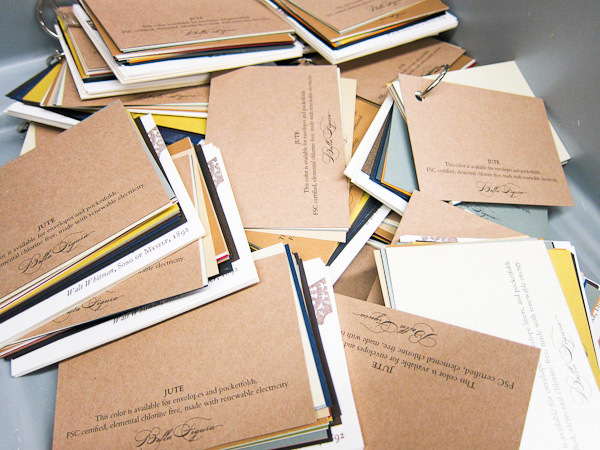 Samples of Legion’s bamboo can be found through Legion Paper (pick up a swatchbook with paper and envelope samples for $5) and LetterpressPaper.com – paper and envelope samples start at $5. Moab Entrada: A 100% cotton smooth fine art paper that is acid- and lignin-free paper. Two sheets of 8.5″ x 11″ Entrada are included in Moab Paper’s sample box, which sells for $26.48 and includes a variety of other fine art papers. Legion Paper also sells a sampling of thirty 8.5″ x 11″ sheets of various Moab papers for $25.98. Mohawk Paper: Superfine is a beautiful paper with lush tactility, smooth texture surface and great for all-around projects. The Strathmore Pure Cotton line provides a crisp texture and beautiful wove finish. Mohawk offers swatchbooks for all of their papers, and prices range from $4.99 – $12.99. Reich Paper offers a swatchbook for $5.95. 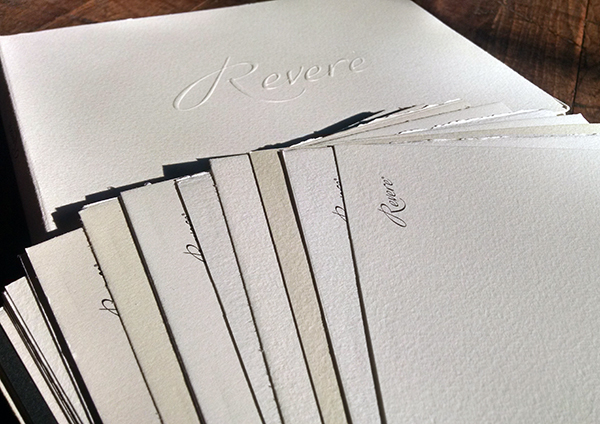 Revere: A luxe and super soft paper that is meant to be held and is perfect for wedding invitations or a card that begs to be touched. A 2″ x 6″ matchbook sample of Revere paper is available through Legion Paper for $0.99. 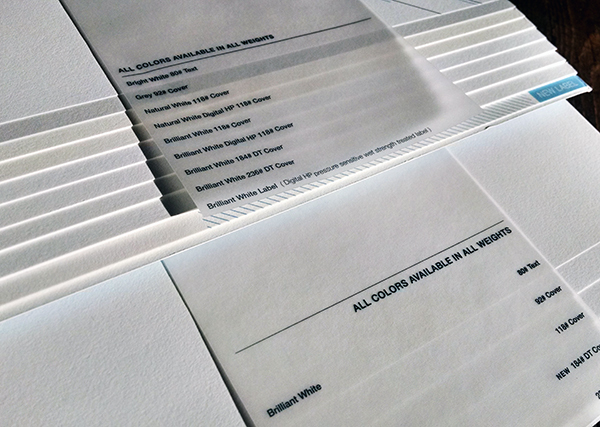 Samples of Rives BFK paper is included in Legion Paper’s Letterpress Selections pack for $12. Somerset: A soft-handling paper with a supple surface texture. Good for wedding invitations or business cards calling for a softer impression or feel. 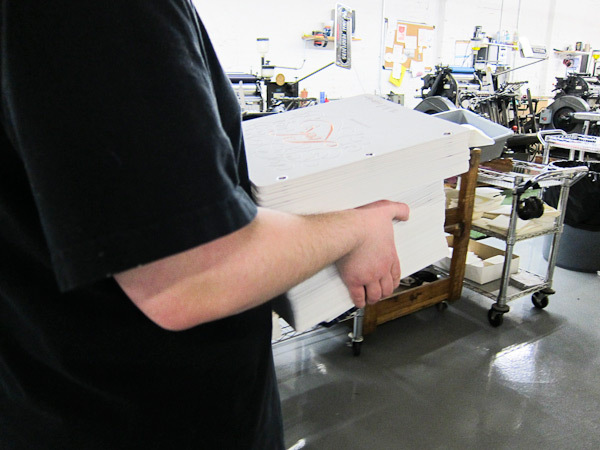 A mill book containing thirty 5” x 5” sheets is available for $7.50 from Legion Paper. Arturo papers: A mouldmade soft, luxurious paper that comes in a variety of colors with matched envelopes available. You can purchase ten 8.5″ x 5.5″ sample sheets through LetterpressPapers.com for $6. 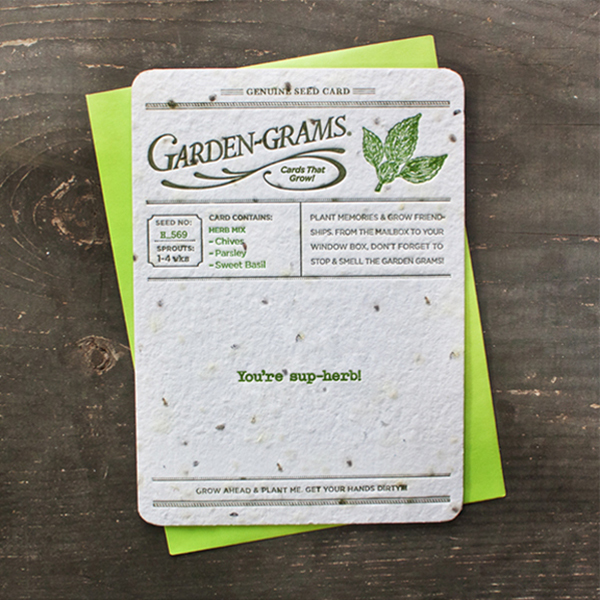 Chipboard and Kraftboard: A thick, heavy weight of paper board that is great for hangtags and coasters. French Paper offers a $5 sample pack that includes every color and weight from their Kraft-Tone line. 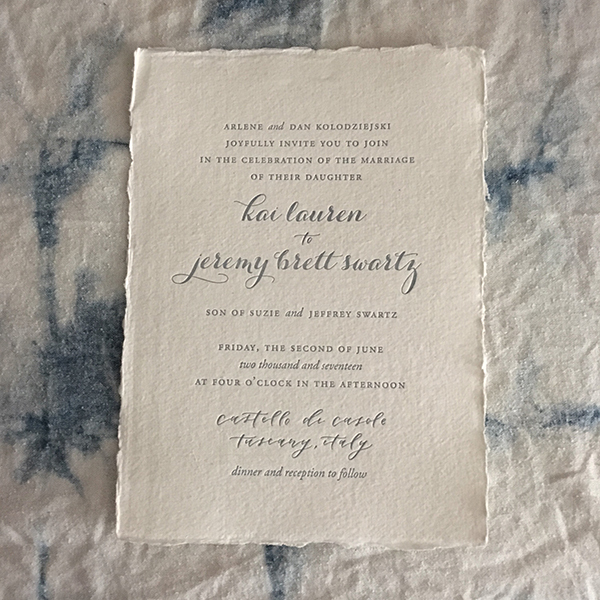 Where do I purchase letterpress paper? 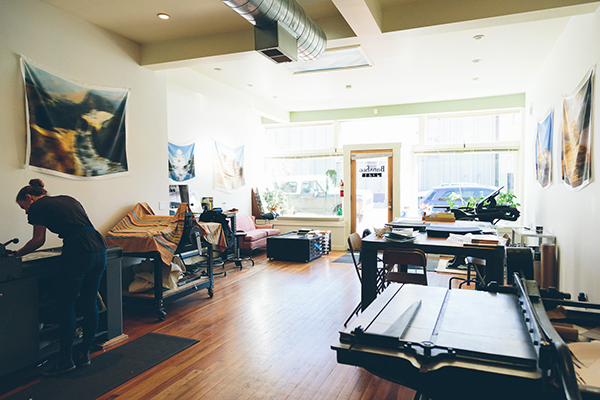 A local fine arts supply store – you may have to special order papers if the store does not carry the papers on the shelf. Michael’s – may carry small quantity packs or specific papers may be special-order items. 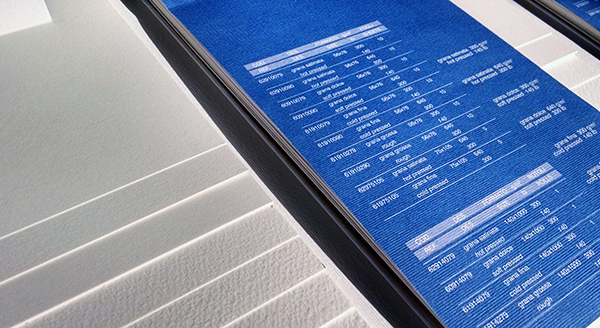 Utrecht – carries a variety of fine papers, including Rives BFK, Moab Entrada, and Lenox 100%. 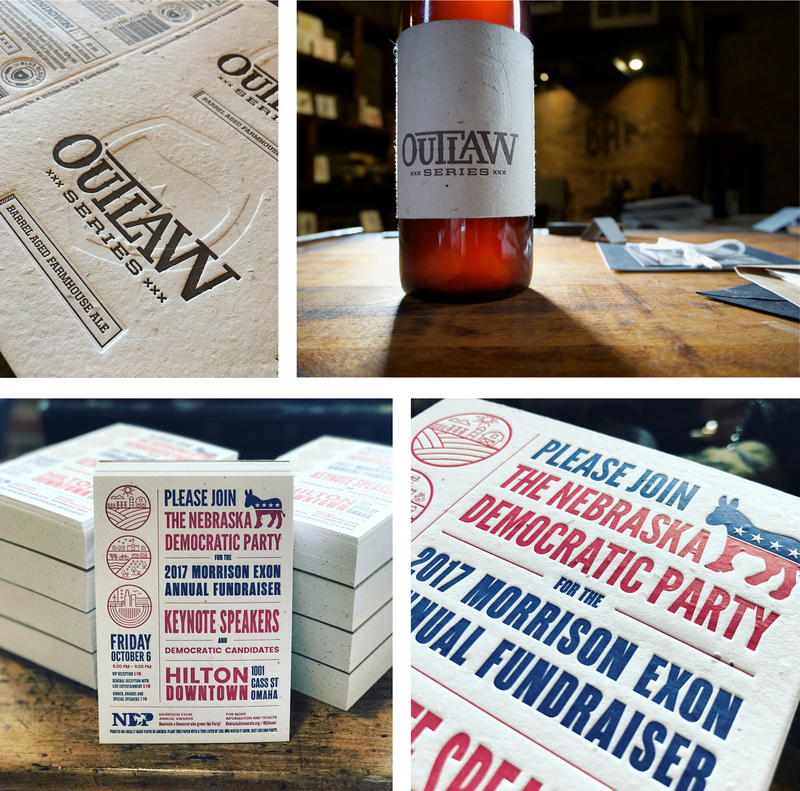 LetterpressPaper.com – a great variety of paper selected for letterpress printing with many different varieties in a multitude of colors. Paper-Papers – another great online paper source with many papers in various sizes. 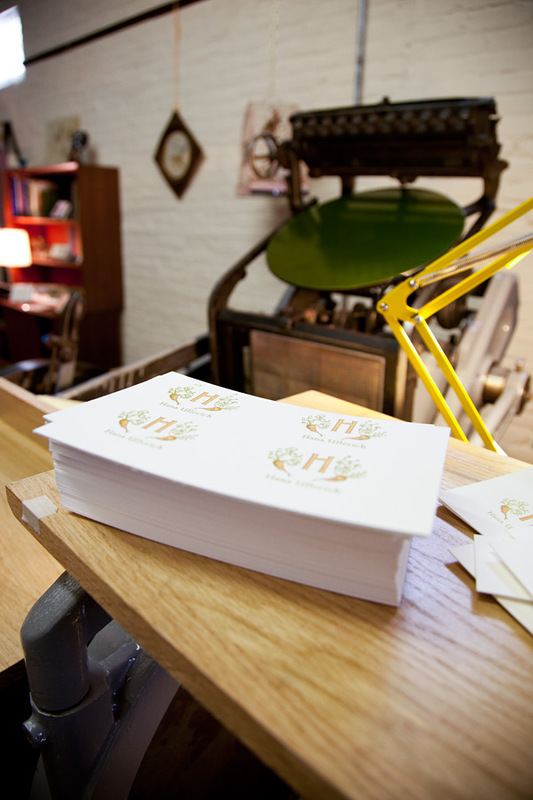 We recommend their “Cotton Papers” for letterpress projects. 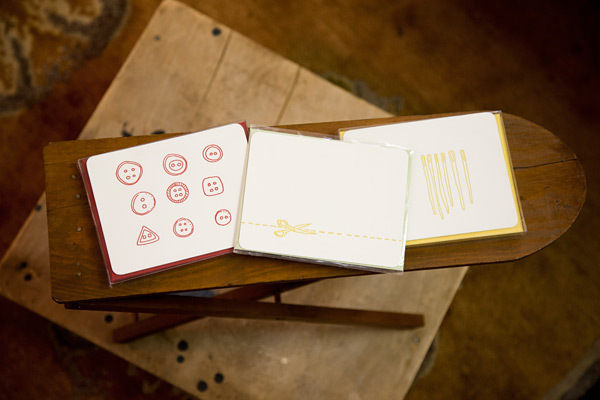 Paperworks – offers letterpress paper options with matching envelopes, including several FSC-certified papers. Hiromi Paper – specializes in Japanese papers, but is also a good source for Arturo and Fabriano papers, postcard weight paper stock, and deckle-edge papers. 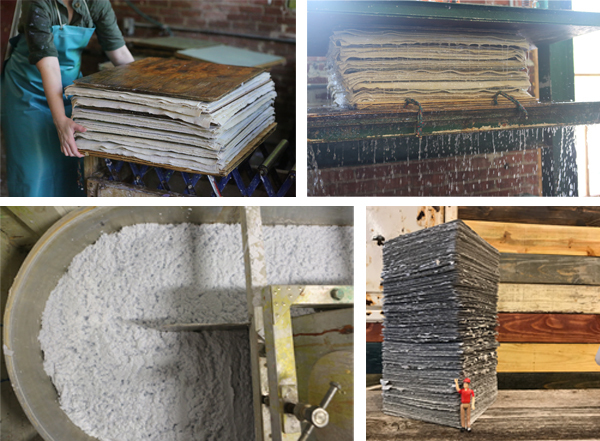 Porridge Papers – nice papermakers who make a great variety of handmade paper. Legion Paper – use Legion’s ultimate paper selector to help narrow down your many options. Crane – purchase Crane Lettra papers in a variety of weights and colors, with various envelope options to match. Twin Rocker – offers handmade papers (check out their swatch set for samples). 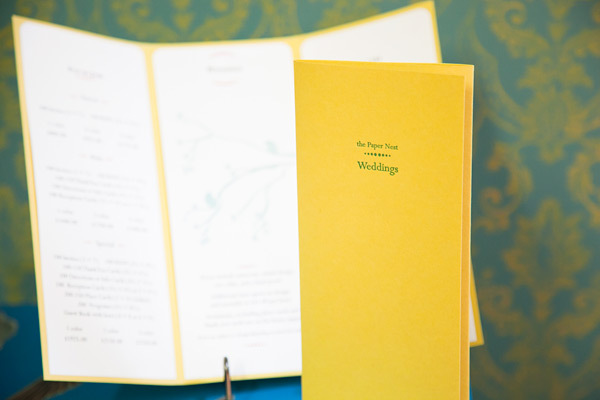 Botanical Paper Works – specializes in handmade papers that are embedded with wildflower, vegetable, or herb seeds that can be planted later on (they offer a seed paper swatchbook for $10). French Paper – produces over 100 stock colors in multiple weights and textures, including kraft papers. Paper Mart – also offers chipboard or kraft papers. Looking for a new luxurious cotton stock paper to try out for your next project? We carry Flurry Paper in our online store here! 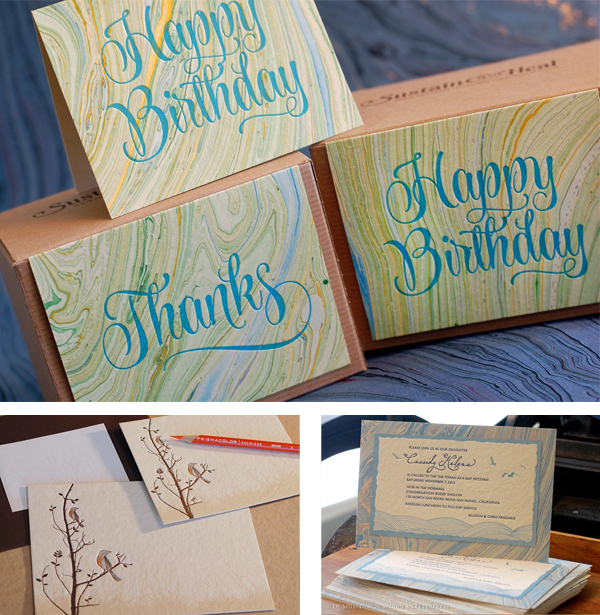 Available in three colors, three weights as well as envelopes and cards! We hope that this essentials list of paper energizes you to search out and try something new for your next project. As always, let us know in the comments section below how you fared and any suggestions to our list that helped you out. We’d love to hear from you! Don’t let this machine get cold! 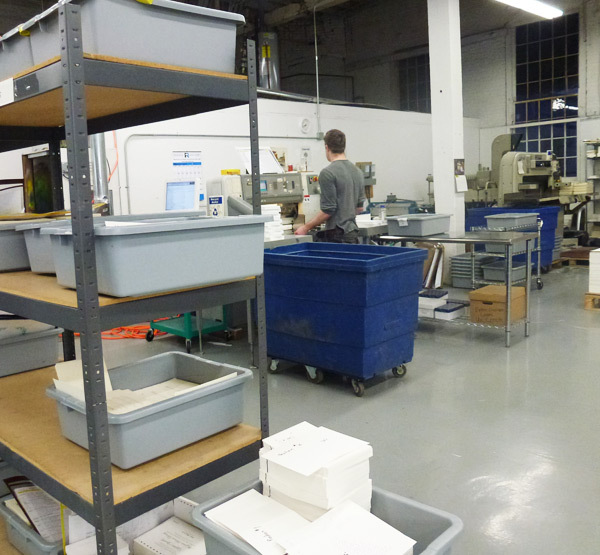 Not to worry, Pat will keep this cutter warm by trimming our printed cards in the multitudes of grey bins. This shelf refills itself all day with assistance from our busy team of printers. 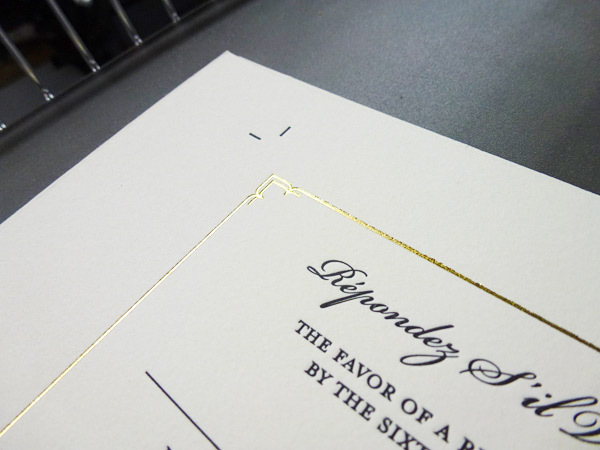 Here is a simple and classy way to let gold foil shine on a traditional wedding invitation. This is jewelry on paper! 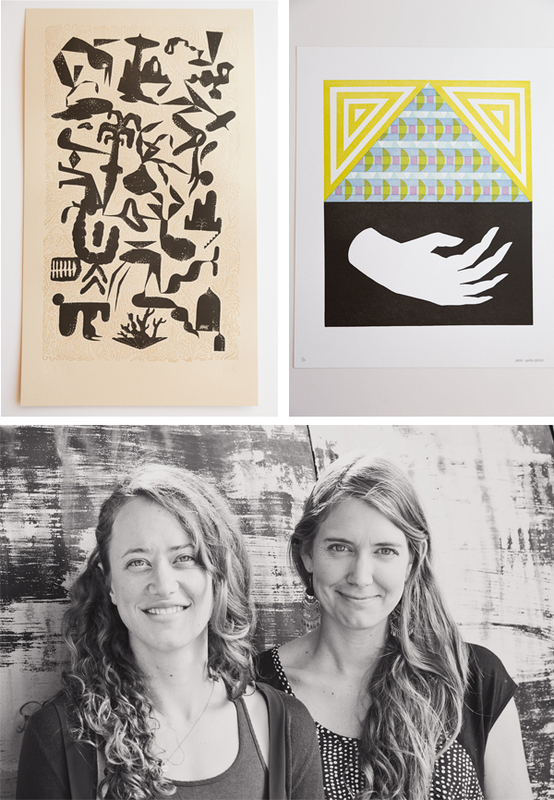 The way Iowa native Elizabeth Munger of The Paper Nest speaks of letterpress, you find her exhilarated, curious, and earnest. 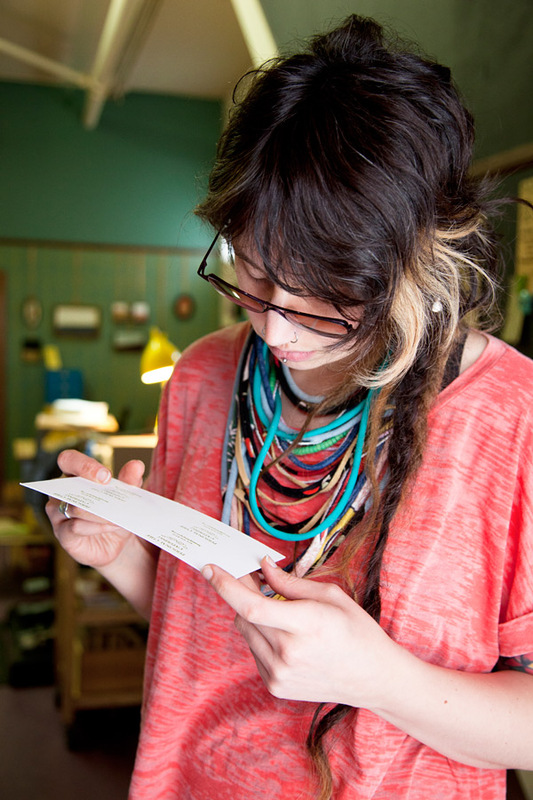 Her voice on the relationship of paper choice and printing is crisp, bright, and even. 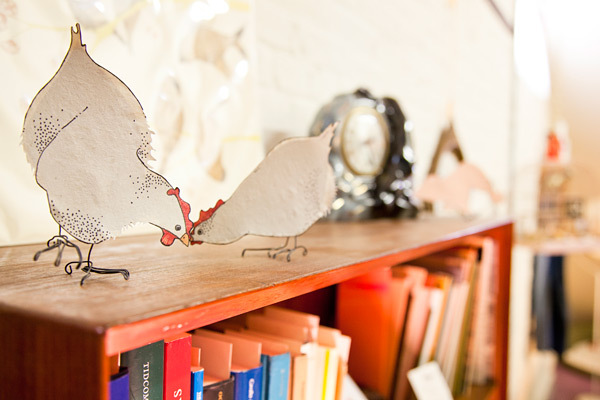 And for good reason—after exploring the University of Iowa Center for the Book program, serendipity chanced upon her when a good friend teamed up with her to form The Paper Nest (a shop that shows lots of love to quality paper and printing). 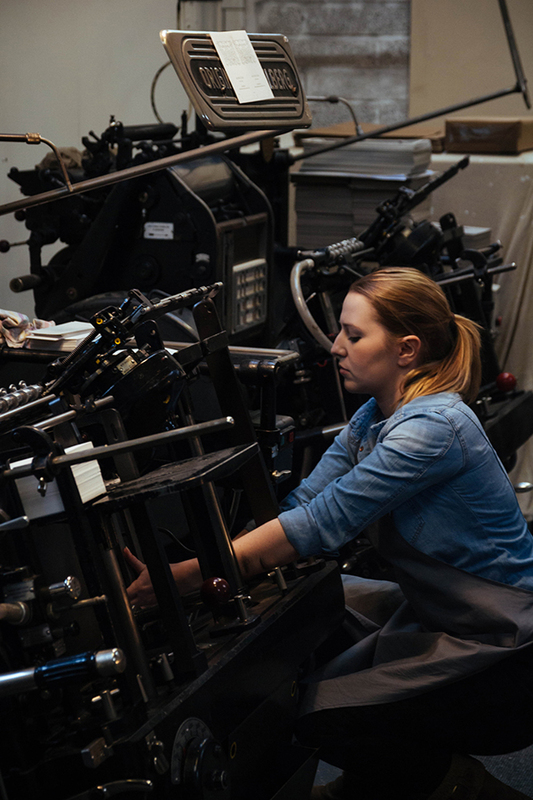 Elizabeth sat down with us to discuss the new future of letterpress, shop tips, and the heaping mounds of press fun that go with it. UP CLOSE WITH ELIZABETH MUNGER I am an Iowa native who’s been making art as long as I can remember. It started with my obsession for drawing horses. I am a maker by nature and my hands are usually busy with some form of crafting.I have been printing for about 14 years and running the Paper Nest for three. Printing is definitely one of the things I enjoy most. I am process- oriented and love problem solving on the press. When I’m not on the press, I’m usually sewing, drawing, and doing collage/ assemblage work. If I have access, I love to make paper. When I’m not engaged in some form of art, my favorite thing to do is pal around with my dog, Mr. Pants. INK IN THE BLOOD My first love was Intaglio. 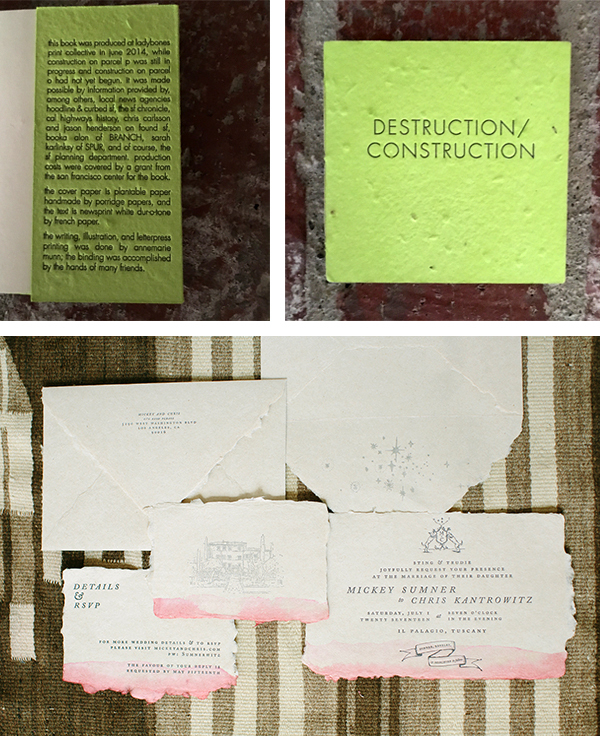 Then, a few years later, I was introduced to letterpress while enrolled in the University of Iowa’s Center for the Book. During my time there, I discovered paper and relief printing which had never made much of an impression on me before. Learning to use a Vandercook was a revelation in printing for me. I went from hand wiping plates to using a self- inking machine. 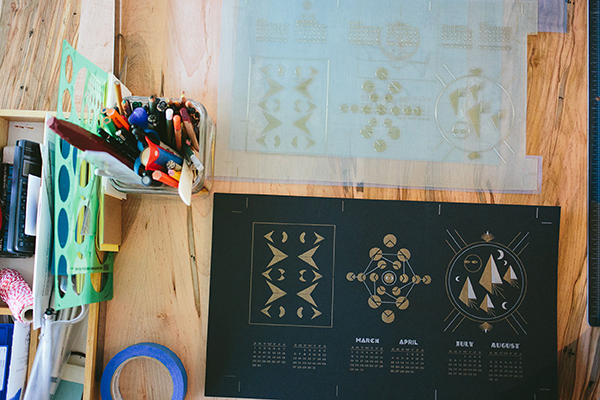 It totally changed the way I thought about printmaking and I felt like I could literally print a million! My main focus was making artist books. I spent a lot of time thinking about images & materials and how they worked together. Since I was set on editioning, I was constantly ordering paper online. I had a friend who was doing the same thing, and one day, she and I were talking about how convenient & great it would be to buy paper locally. The idea eventually worked its way into the Paper Nest and because paper & printing go so well together, it seemed only natural to make it a paper and letterpress shop. 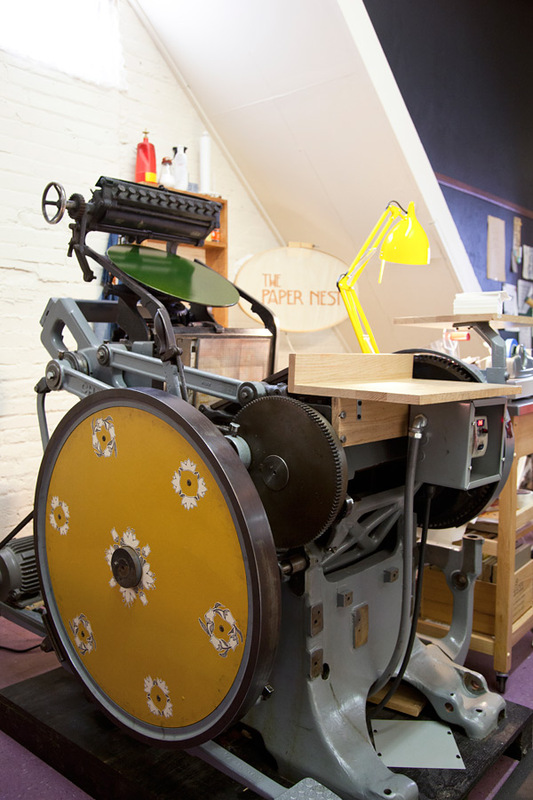 INKING UP IN IOWA The Paper Nest is a combination letterpress and paper store. 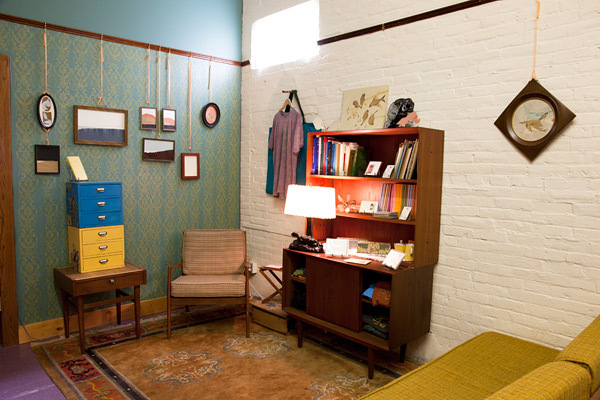 I sell printing and bookbinding papers and tools and custom letterpress printing. I ran it out of my home the first year. 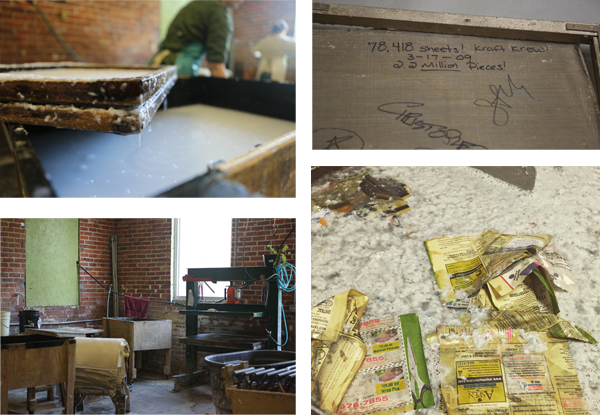 The Vandercook was in my home studio and my paper inventory was on a second floor studio that I rented. My first inventory order was 450 lb. and I pretty much knew then and there that I needed to find a location that was ground level. I sort of lucked out a year later when I ran into a friend of mine, who runs a bead store, Beadology, here in Iowa City. She had a space in the back that she was interested in renting to another small business. 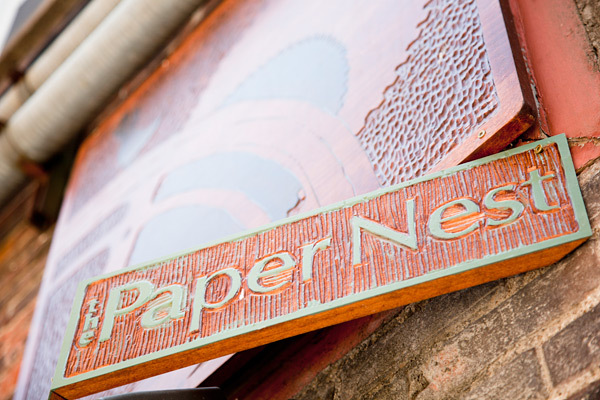 This became the home of the Paper Nest. Now I have a downtown location that has an alley entrance and is big enough to house me, my dog, Mr. Pants, a C&P craftsman, a huge guillotine, paper cutter and all my paper. 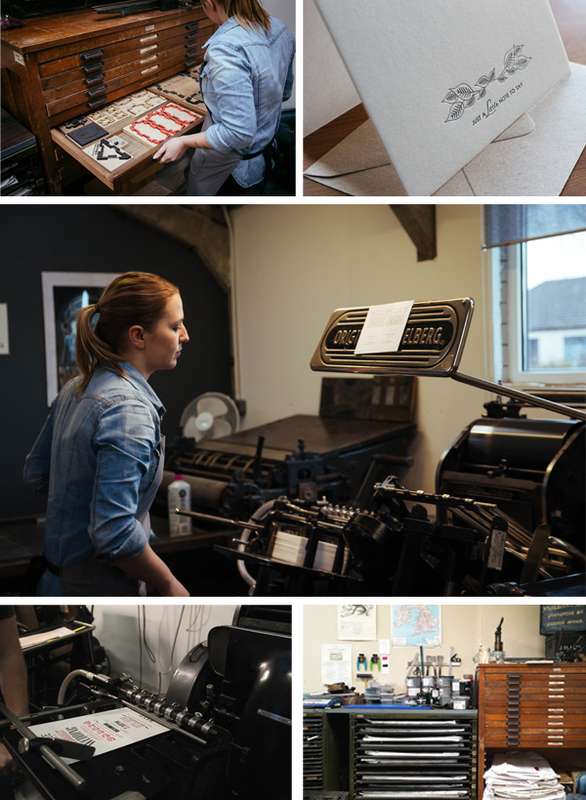 We have been here going on 2 years now, and I am constantly humbled with how lucky I’ve been to be surrounded by such a great printing, bookbinding, & crafty community. PRINTING LEGACIES Virginia Myers was my first printmaking instructor at the University of Iowa, and was a huge influence on my intaglio and foil printing. She is an amazing person, & without her I would have never discovered printmaking. 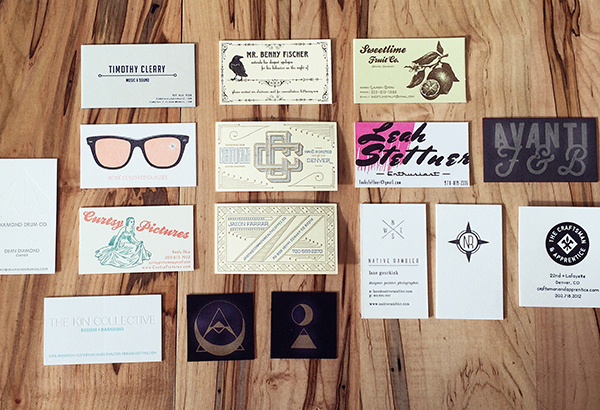 My other mentors would probably be the ladies I took my first letterpress class with. I had never been part of a group that was constantly doing such great work. This really encouraged me to push myself & make the best work I could. THE DAILY GRIND As much as possible, I like to collaborate with whomever I’m working with/ for. I try to start by getting as much of an idea of what they want. Sometimes this means we work backwards from what they don’t like to get to what they really like. For example, we might start with something as vague as colors or tone to more concrete ideas such as image. I really enjoy researching to play on historically correct images, font, and materials. I tend to draw everything by hand and then combine it with text. I try to use the computer as a tool, not as my main substrate. PRINTER’S PARADISE I am both [a printer and designer], although I feel like I relate more into an artist/ printer category then designer. My goal is to definitely have one job: printing and talking about paper. PRINTING FEATS Opening up this business is probably one of my biggest accomplishments. I have to learn all sorts of things that I never thought I would. My latest accomplishment, which I am very excited about, is that I was accepted into the MFA program at the University of Iowa Center for the Book and will be starting this fall. BOXCAR’S ROLE Boxcar has been awesome! It is nice not worrying about making plates. It’s so convenient to be able to send out a digital file and get plates back that are so clean. If it weren’t for Boxcar, I would have more steps and be spending more time making them myself. It’s such an advantage to be able to call Boxcar and get advice on how to make a file better for plates. I also think their printing videos are great. I feel like they really walked me through a number of printing issues. This was pretty great because it allowed me to really get to know the press and it made it seem more like mine. The other interesting thing is that she bought the press, along with the rest of a print shop, from someone who had been storing it for years, in a garage in Sioux City, Iowa. Coincidentally, I grew up in this city, so we were in the same place at the same time but never met. It took us both moving to Iowa City to meet! SHOP TIPS My best piece of business advice is to take advantage of your local resources. If you don’t know how to do something there is usually some one in your community who is happy to help and vice a versa. This also helps to build a community. I also think being open to new possibilities and taking action is what ends up making me feel the most successful. WHAT’S NEXT Well I’m lucky enough to have my sister, Katie Munger, back in Iowa. She has similar interests and recently decided to come back here and help me with the Paper Nest. I’m also really looking forward to getting a better handle on the business end of things and expanding. I’m hoping to offer more preprinted products as well as custom work and binding workshops. Eventually, I’d like to be able to offer equipment rental and printing workshops. 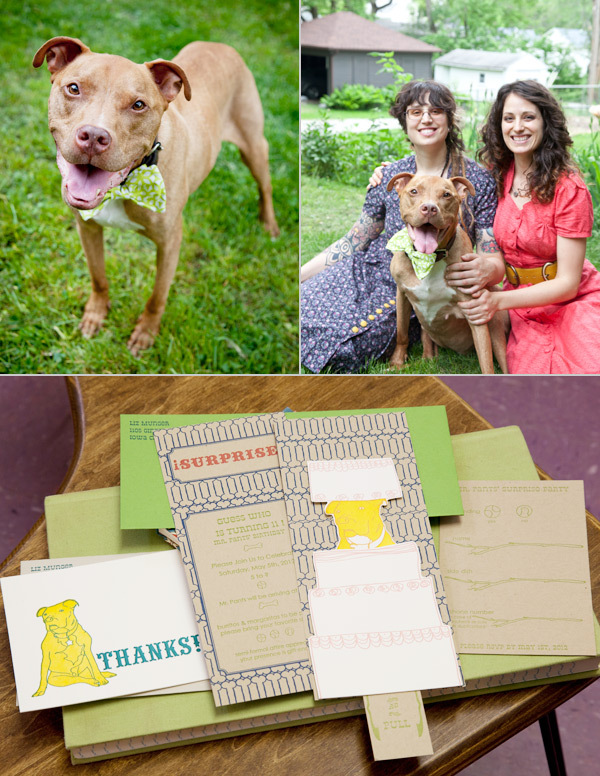 Big round of thanks to Elizabeth for letting us get the full scoop on The Paper Nest!